I just came across these outfit(ish) photos on my camera that I took in that heatwave week that we had. I totally forgot about them, so I thought I'd upload them now, even though it's a little late! 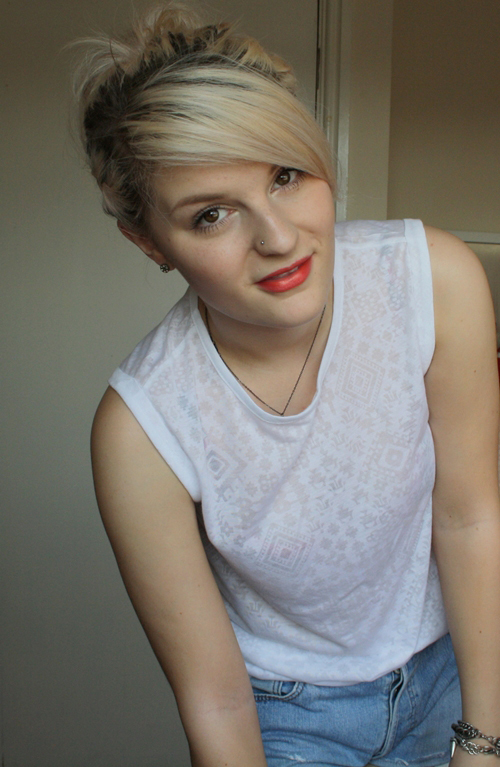 This was prior to me cutting my fringe, plus my roots look horrific... this was, what, two weeks ago? Reaffirming I need to sort my ruddy roots out! I'm growing to like 17 Lasting Fix in Hot Chilli. Although I feel I have to be tanned to wear it due to it's warm tone (yes, I'm wearing fake tan here... I'm really pale naturally). I've had it for about half a year now, but I rarely bother to put lippy on, so it's grown on my, slowly. 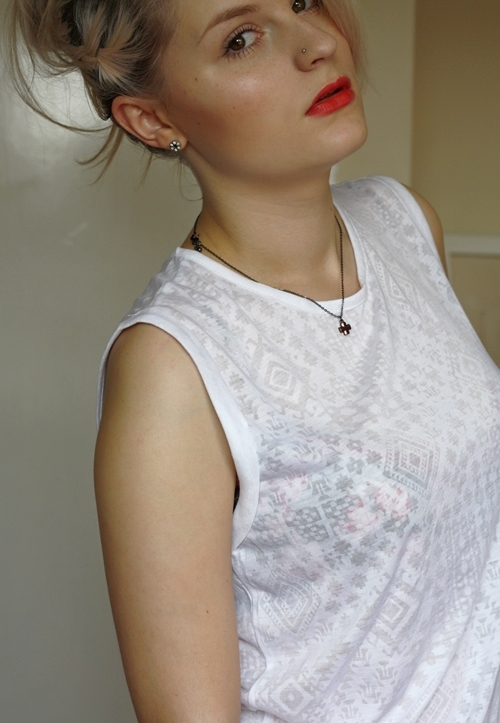 I love this Aztec, burnt-out effect vest top from Primark. It was just £4 - absolute steal! I love it so much that I picked it up the other day when I went shopping in grey - you can see my haul video here! Hope you've all enjoyed the bank holiday weekend - I haven't had one as such as it's just been revision, revision, revision (moaning student!). I'm also waiting on some new fake disco pants to arrive (mine have finally started to die!) and some Docs too, so I've been waiting over the bank holiday! I'm going to try not to make any impulse purchases for a while...! I love this! Your top is so great and those lips! Just found your blog - it's lovely and it looks fantastic! That lippie is great on you. Ooh I nearly bought that tee but the queue was too long...now I wish I'd waited! I might be interested in doing a blogpost, if u'd be interested?! This makes me miss the heatwave! I love heatwaves haha :) and I always love a pair of DIY denim shorts! the hot chilli lip is gorg on u! love it!